What is the one thing we can’t live without; not even for several minutes but fail to appreciate it? The answer is AIR. Many people are fumigating themselves on a daily basis by placing synthetic/artificial ‘air fresheners’ inside their homes; unaware of their toxic ingredients. Read the labels people. Get to know what you’re breathing in. My mother and I value every breath we take and that is why we now use a CASA AROMA GENIE ULTRASONIC DIFFUSER. This small appliance, from TOAST LIVING, releases a lovely aroma of invigorating essential oils into the air by its capability of emitting a 2.5 million ultrasonic vibration per second once turned on. By pulsating at a high frequency, the CASA AROMA GENIE ULTRASONIC DIFFUSER reacts with the essential oils, dispersing their molecules (particles) into the air which purifies the air we breathe. Just add purified water and a few drops of your favourite essential oils into the diffuser and let the heat-free diffusion of this little ‘genie’ work its wonders by improving the atmosphere in your home and even at the office. It’s electronically programmed to turn off when it runs out of water or when the time is up. Mine blends in well with the decor, is modish (modern), and is virtually noiseless. A heat-free ultrasonic diffuser such as the CASA AROMA GENIE is a good choice because heat is able to deteriorate essential oils and is capable of interfering with the quality of the oil’s benefits. 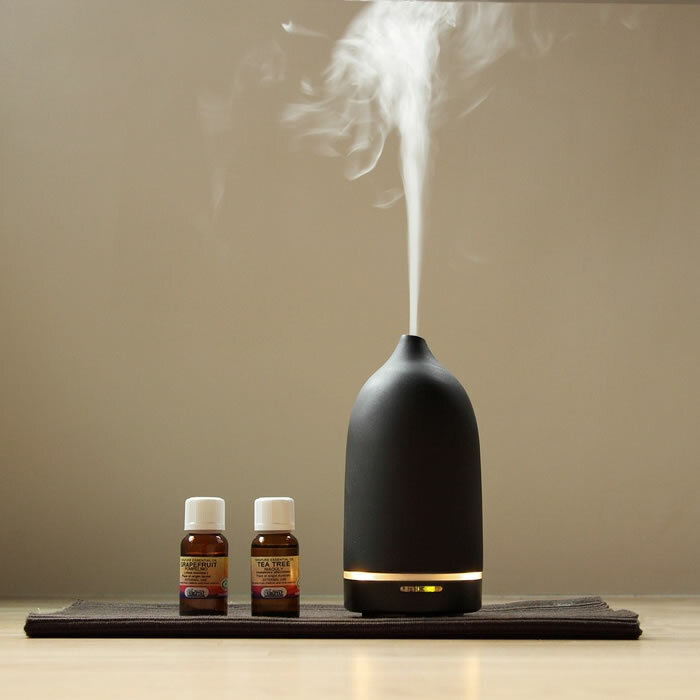 I feel that at this point in time, it is best to use a diffuser for circulating into the air a fine mist of natural oils from nature’s plants that offer therapeutic (healing) benefits; including their anti-bacterial and calming effect to aid in our wellbeing. To add icing on the cake, so to speak, the negative ions which the CASA AROMA GENIE ULTRASONIC DIFFUSER carries into our air helps to calm the body too. The CASA Aroma Genie has been a wonderful investment for my mother and I. We are pleased we bought it. This diffuser is best used in a bedroom or small room when the doors are closed. Having a fan also helps to circulate the mist of essential oils into the air. So much better. Being a novice on my first day, I started off by using 3 drops of Living Libations “Immune Illume“in our diffuser as I wasn’t quite sure how strong the scent would be in our bedrooms. Gradually I increased the drops to five then eight. Diffusing a couple of hours before going to bed each day/night with the bedroom door closed and the fan on helped to circulate the mist. We try to alternate with other essential oil blends each day but our favourite essential oil that we’ve been diffusing at night is Immune Illume. Our cat Bella loves the aroma and is so relaxed. Another essential oil blend I like to use is Living Libations “Deep Breathing”. The forest will come to you with this blend. During daytime I have diffused Annmarie Gianni’s “Vibrance” and Essentially Australia “Lemon Myrtle Essential Oil” and both fragrances are so uplifting. Thankfully Hart & Heim an Australian distributor for TOAST LIVING were stocking the CASA Aroma Genie Diffusers. After watching some You Tube presentations of the CASA Aroma Genie Diffuser, I decided to call Dione Hart from Hart & Heim for a chat and placed my order. Our diffuser was packed well. Thanks Dione.